I wasn’t totally sure what to expect when I hit the “Rent” button on iTunes for this movie. The novel, while I think it has it’s optimistic moments, has some very realistic and somewhat graphic content. The Outsiders is definitely an excellent representation of the novel it’s based on. I think the hardest thing about taking a story from the page and turning into a movie is preserving the prose, and the full effect of Hinton’s prose was kind of lost on me as I watched the movie. There were certain things that helped explain the characters to me as I read the novel, but that didn’t make it into the movie (and admittedly might not have worked) such as the difference between “tough” and “tuff.” My other small complaint was the music--they decided to go with instrumental, non-lyrical music, which was okay. I felt that some lyrical rock might have better fit the atmosphere, but it’s a matter or personal preference. Aside from these two small complaints, The Outsiders was a fantastic movie. I have to say, I was afraid that it would be sugar coated and wouldn’t capture how Ponyboy felt amidst the socs, but instead the movie felt raw and honest. The serious aspects of the film about “staying golden” were very well done. I do wish that there had maybe been a bit more emphasis on why it would have been bad if Ponyboy ended up in a boys’ home, but that’s a minor complaint. Overall, this is a fantastic adaptation, if you’re willing to see the seriousness of the novel captured on screen. 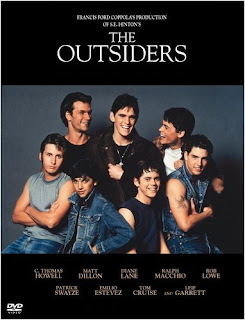 I highly recommend The Outsiders to those looking for a serious and poignant film.